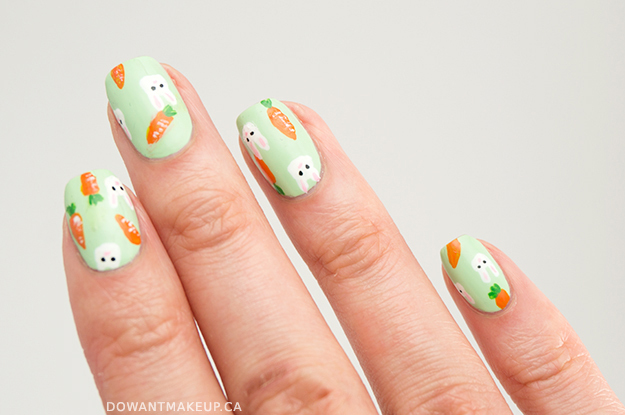 Taking a break this week from fashion week-related nail art for something fun to reflect the warmer spring weather we've been having lately! Recently, I started following a certain nail artist on Instagram; she is so talented and original with her super intricate print patterns. 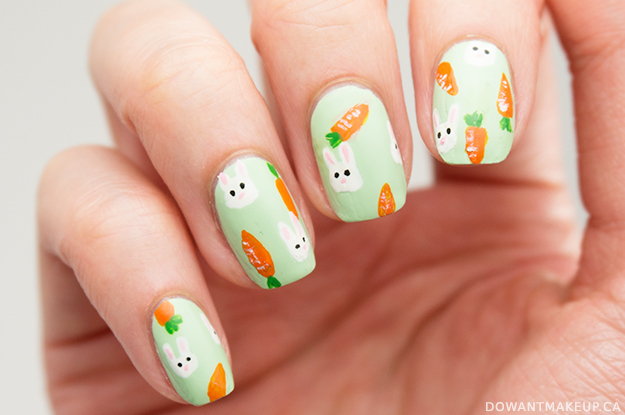 Today's nail art is inspired by her Easter nail post, although not quite as detailed. For the base, I used Mineral Fusion Glint of Mint. I think I've posted this polish before on my Instagram but not on the blog. I didn't have a base colour in mind when I decided to do this look, but gravitated towards this mint pastel because it has spring/Easter written all over it! If you haven't checked out the Mineral Fusion line at London Drugs yet, you totally should; the polishes I've tried so far are extremely smooth and easy to use. Pastels have a rep of being difficult, but Glint of Mint is ssssooooo forgiving, and opaque in two coats too. Everything else is acrylic paints. I tried using an orange polish at first, but the mint green base really dulled the bright orange. Acrylic paints are generally more opaque and forgiving. Hope the sun is out and shining wherever you are!